Well, I’m finally back to work on Tom’s Christmas present. Ahem. 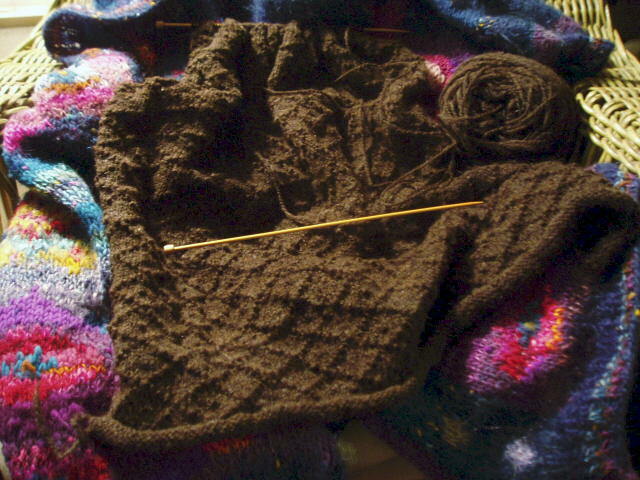 It’s Ravelympics time again, and I’m determined to whale on this WIP and get ‘er off the needles. The skein you see on the right is skein #2…the equivalent of 1 bobbin of 2-ply. I overestimated how much fleece I would need…this CVM/Romney goes a long way! When I finish the back…you’re looking at the back of the sweater on a #4 straight bamboo needle…I’ll go back to pulling roving and spinning. I have plenty of Gracie washed and ready to go. This winter has been so cold…and Tom wants his sweater!!!! So think “cheering me on” thoughts, okay?